This entry was posted in Waste less recipes and tagged bird's eye chilis, cherry pickles, cherry vinegar, cooking, fruit pickles, galangal, ginger, lemon grass, pickled cherries, preserving, recipe, recipes, sour, spicy, sweet, Thai pickled cherries, vegan, vegetarian, vinegar by Jean-François. Bookmark the permalink. That is right up my street. I do a Scandinavian raspberry vinegar (to cover cooked and peeled beetroot) with cardamom, coriander seeds and dried bird’s eyes. But I never thought of doing this with cherries (they are expensive here) but this really sounds so lovely. PS I need to get back to you about your app email! That sounds delightful – will let you know how the cherry experiment ends up working. The flavor of the fruit certainly stood out nicely in the vinegar, so have high hopes. Mmmm, this has my adventurous side.thinking about other fruits to use for this recipe… Pear vinegar anyone? Really cool idea, would make a great drink garnish! Great idea – I’ll try that when we crack the pickles open. We tend to stick with wine, so if you have any good ideas on pairing, please share. Martini with spicy Thai cherry pickle perhaps? Definitely let us know! 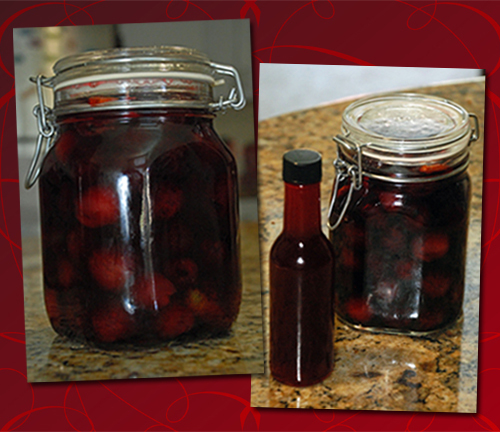 I just tasted some pickled rhubarb that I made a year ago – it was a huge hit with my family! It’s always fun to see what creations come out of the pickling jar. Pickled rhubarb sounds intriguing – what did you toss in there? Definitely something I’d like to try. Can’t take any credit- but a great recipe! Those sound great. Thanks for sharing! What a great post! Thanks for sharing this. I’m going to give this a try!